I like to extend my deepest gratitude to you and the whole VIP team. 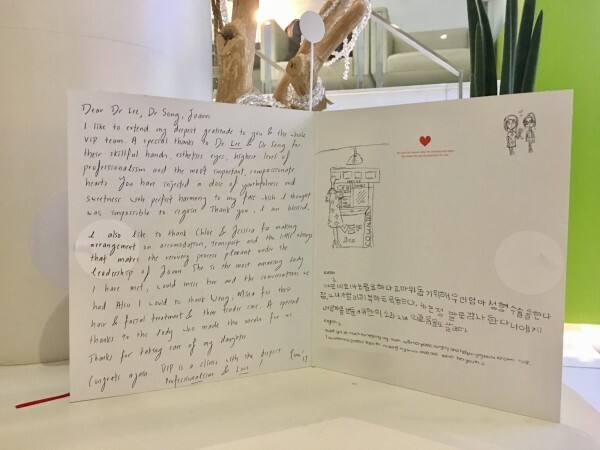 A special thanks to Dr. Lee and Dr. Song for their skillful hands, aesthetic eyes, highest level of professionalism and the most importantly, compassionate hearts. You have injected a dose of youthfulness and sweetness with perfect harmony to my face which I thought was impossible to regain. Thank you, I am blessed. I also like to thank Chloe and Jessica for making arrangement on accommodation, transport and the little things that makes the recovery process pleasant. Under the leadership of Joann, she is the most amazing lady I have met, could miss her and the conversations we had. Also I would love to thank Weng and Mina for their hair and facial treatment and their tender care. A special thanks to the lady who made the food for us. Thanks for taking care of my daughter. Congrats again. VIP is a clinic with the deepest Professionalism and Love.